Mice in heating ducts create foul odors with their urine and feces. 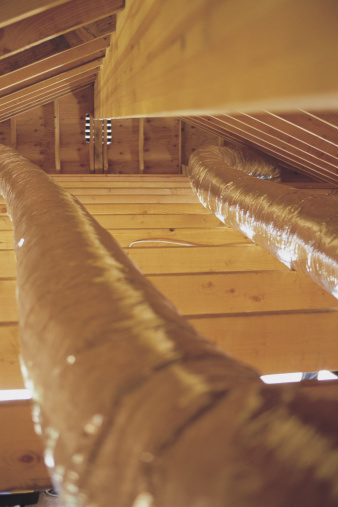 If the mice build nests, they can block the air flow of ductwork in a home and reduce the efficiency of the furnace. Don't use poison to rid heating ducts of unwanted pests, because dead mice will stink up the house and possibly spread disease. You can use snap or glue traps, but preventive maintenance is your best defense. Mice can cause a stink in your home heating system. Inspect the heating ductwork for holes. These are the entry and exit points for the mice. Cover these holes with duct tape. Count the number of heating vents in the house. Bait as many mouse traps as there are heating vents. Apply peanut butter using a disposable butter knife. Remove the heating duct vent covers in every room in the house using a flat-head or Phillips screwdriver. Set a snap trap by pulling the locking bar out of the way and pulling back the spring-loaded bow. Hold the bow down with one hand and put the locking bar over the bow. Insert the bar into the latch to set the trigger. Set the traps and put them inside the ductwork through the vent holes. Place a glue trap in the hole alongside the baited snap trap for a backup. The sweet scent of the glue attracts the mice. Replace the vent covers and wait. Check the traps every 24 hours. Remove all traps that have caught mice and dispose of them. Re-bait the traps and place them until all mice have been removed from the ductwork.